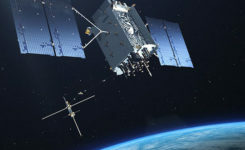 End users first experienced the amazing capabilities of GPS 12 years ago with early mass-market GPS devices. The focus was on navigation applications with specific tracking devices like personal navigation devices and personal digital assistants (PNDs, PDAs). With the advent of smartphones, GPS became a must-have feature. Other constellations were added to improve performance: GLONASS, QZSS, SBAS, and very recently, BeiDou. In the current phase, the focus is shifting to fitness applications and background location. This is not an insignificant change. Always-on connected applications, high-resolution displays, and other such features do not improve battery life. This article describes new ultra-low-power, high-accuracy location solutions for wearables’ power consumption. New applications require frequent GNSS updates with regard to user position. Sometimes the application will be open and other times it will not. The chips need to keep working in the background, buffering information and taking predefined actions. The GNSS chips need to be able to cope with these new requirements in a smart way, so that battery life is not impacted. Saving power is now the name of the game. can be flexibly configured for non-navigation applications. new flexible configurations, duty cycling intervals, GNSS measurement intervals, batching, and so on. These features require hardware and software architectural changes. The new chips need more RAM than that required for smartphones, as they must now host the ME and PE. Wearables and IoT devices are small, cheap, and power-efficient. They do not have large processors and spare memory to run large software drivers for the GNSS chip. In many cases, the device’s microcontroller unit (MCU) is designed to go into sleep mode if not required, that is, during background applications. Therefore, new GNSS chips with more RAM are much better adapted to this new scenario. New chips must tightly integrate with sensors. The accelerometer provides extremely valuable information for the position update. It can detect motion, steps, motion patterns, gestures, and more. However, as a general rule, the MCU’s involvement in positioning should be minimized to reduce power consumption. For power efficiency, the new GNSS chips must interface directly with the sensors and host the sensor drivers and the sensor software. Finally, new chips must adapt to different human activities as they are integrated into wearable devices. This is the opposite approach from past developments where GNSS development was focused on one use case: car navigation. Now they must adapt to walking, running, cycling, trekking, swimming, and so on. All these activities have their particularities that can determine different modes in which new GNSS chips can work. Electronics must now conform to humans instead of the other way around. New wearable-chip GNSS tracking strategies include dynamic duty cycling and buffering, which contribute to the goal of reducing power consumption without compromising accuracy. Satellite positioning embedded in devices over the last few years first saw on-chip positioning before the era of smartphones, where you had dedicated SoCs that supported the silicon used to compute the GNSS fix. These expensive chips had lots of processing power and lots of memory. Once GNSS started to be integrated into cellphones, these expensive chips did not make sense. GNSS processing could be offloaded from the expensive SoCs, and part of the GNSS processing was moved onto the smartphone application processor directly. Since navigation is a foreground type of application, the host-based model was, and is still, a very good fit. But with advances in wearable devices, on-chip positioning will become the new architecture. This is because the host processor is small with very limited resources on wearables; and because energy must be minimized in wearables, reducing the processor involvement when computing GNSS fixes is critical. Some vendors are taking old stand-alone chips designed for PNDs and repurposing them for wearable devices. This approach is not efficient, as these chips are large, expensive, and use a lot of power. While the new fitness and background applications in wearables have forced changes in GNSS chips’ hardware and software architectures, GNSS accuracy cannot be compromised. Customers are used to the accuracy of GNSS; there’s no going backwards in performance in exchange for lower power consumption. Figure 1. Software architecture for wearables. A series of tests shown here demonstrate how a new wearable, ultra-low-power GNSS chip produces a comparable GNSS track to existing devices using repurposed full-power sportwatch chips, while using only a fraction of the power. Speed Accuracy. Not only does the ultra-low-power solution produce a comparable GNSS track, it actually outperforms existing solutions when it comes to speed and distance, thanks to close integration with sensors and dynamic power saving features (Figures 2 and 3). Figure 2. Ultra-low-power versus full power. Figure 3. Full-power sportwatch, left, and ultra-low power chip, right, in more accuracy testing. GNSS Reacquisition. GNSS-only wearable devices face a design challenge: to provide complete coverage and to avoid outliers. This is seen most clearly when the user runs or walks under an overpass (Figure 4). Familiar to urban joggers everywhere, the underpass allows the user to cross a busy road without needing to check for traffic, but requires the GNSS to reacquire the signals on the tunnel exit. See the GNSS track in Figure 5: when the device reacquires the signals, the position and speed accuracy suffers. Figure 4. Position accuracy on reacquisition, emerging from overpass. Figure 5. GNSS speed accuracy on reacquisition. Using the filtered GNSS and sensors, however (Figure 6), enables smooth tracking of speed and distance through the disturbance. Figure 6. Sensors provide smooth speed estimate. Urban Multipath. The pace analysis in Figure 7 shows a user instructed to run at a constant 8-minute/mile pace, stopping to cross the street where necessary. The red line on each plot shows the true pace profile. The commercial GNSS-only sportwatch on top shows frequent multipath artifacts, missing some of the stops and, worse for a runner, incorrectly showing erroneously high pace. The ultra-low-power chip captures all the stops and shows a constant running pace when not stopped. Figure 7. Urban multipath tests. It is well known in the community that regular sportwatches give unreliable speed and distance estimates in urban environments — where most organized running races are held! There’s nothing worse, as a runner, than to hear the distance beep from your watch going off earlier than expected: how demoralizing! The major benefit of this solution is that the speed estimate is much more reliable in the presence of multipath. At the same time, battery life can be extended because the GNSS is configured to use significantly less power. fSpeed in existing solutions is computed in two different ways: indirectly from two consecutive, time-stamped GNSS position estimates, each derived from range measurements to the satellites, and directly from the Doppler frequency offset measurements to the satellites. Both range and frequency measurements are subject to significant error when the direct path to the satellite is blocked and a reflection is acquired. The effects of multipath mean that the range error may in typical urban environments be hundreds of meters. The frequency error is also a function of the local geometry and is typically constrained by the magnitude of the user’s horizontal speed. Running along a street in an urban canyon and turning a 90-degree corner. Running along a pedestrian lane and taking a short road underpass. Running under tree cover and suddenly arriving at an open area. Running under an elevated highway and turning 90 degrees to a wide-open area. In each case, the chips are using a certain set of satellites, and suddenly other, higher signal-strength satellites become available. A typical situation is for the position to be lagging the true position (while under tree cover, going through an underpass) and needing to catch up with the true position when arriving to the wide-open area. A jump in position is inevitable in that situation. This is not too bad for the GNSS track, but it will mean a noticeable peak in the speed values that is not accurate. Fitness applications save all of the computed speed values and generate a report for each workout. These reports are not accurate, especially the maximum speed values, for the reasons explained above. Figure 8 describes a typical situation where the actual speed of the runner is approximately constant. GNSS fixes are computed regularly; however, the speed computed from subsequent GNSS fixes have sudden peaks that spoil the workout speed reports. Figure 8. Sudden peaks spoil workout speed reports. The new ultra-low-power solutions for wearables solve this problem by deriving speed and accumulated distance from the sensors running in the device. This avoids incorrect speed peaks, while still being responsive to true pace changes by the runner. In running biomechanics, runners increase pace by increasing step cadence and/or increasing step length. Both methods depend on the runner’s training condition, technique, biomechanics, and so on. As a general rule, both step cadence and step length increase as the running speed increases from a jogging speed to a 1,500-meter race speed. A runner may use one mechanism more than the other, depending on the moment or on the slope (uphill or downhill). In the case of male runners, the ratio of step length to height at a jogging speed is ~60 percent.The ratio of step length to height in a 1,500 meter race speed is ~100 percent. For female runners, the respective ratios are ~55 percent and ~90 percent. The ultra-low-power chips take into account both mechanisms to derive the speed values. The sensor algorithms count the number of steps every time interval and translates the number of steps into distance multiplying by the step length. The reaction time of the GNSS chip to speed changes based on a higher cadence is immediate. Speed changes due to longer steps are also measured by the ultra-low-power chips. The step length is constantly calibrated by the GNSS fixes when the estimated GNSS position error is low. The reaction time of the GNSS chip to speed changes based on longer steps has some delay, as it depends on the estimated error of the GNSS fixes. The ultra-low-power, high-accuracy, 40-nanometer single-die BCM4771 chip was designed by Broadcom Corporation. It is now being manufactured in production volumes and is focused on the wearables and IoT markets.It consumes five times less power than conventional GNSS chips (~10 mW) and needs 30 KBytes of memory in the MCU for the software driver. It features tight integration with the accelerometer and innovative GNSS tracking techniques for extremely accurate speed, accumulated distance, and GNSS tracking data. Steve Malkos is an associate director of program management in the GPS Business Unit at Broadcom, responsible for defining GPS sensor hub and indoor positioning features. He has a B.S. in computer science from Purdue University, and currently holds eight patents,10 more pending, in location. Manuel del Castillo is an associate director of marketing for Broadcom in the GNSS group. He has an MS in electronic engineering from the Polytechnic Universityand an MBA from the Instituto de Empresa, both in Madrid, Spain. He holds three patents in location with five more pending. Steve Mole is a manager of software engineering for Broadcom in the GNSS group. He received his bachelor’s degree in physics and astrophysics from the University of Manchester.